Local advertising startup Yext has a new chairman, Michael Walrath. Walrath was the founder and CEO of Right Media, an online advertising exchange which he sold to Yahoo for $850 million in 2007. Since then he’s been investing and starting other projects. One of his biggest investments is Yext, where he is the largest individual shareholder outside the company. Walrath became a board member of Yext about a year and a half ago when he first invested in the company’s $25 million series B. Now that he is taking chairman role, he will be at Yext’s New York City offices once a week plotting the overthrow of the online local advertising world with CEO Howard Lerman. 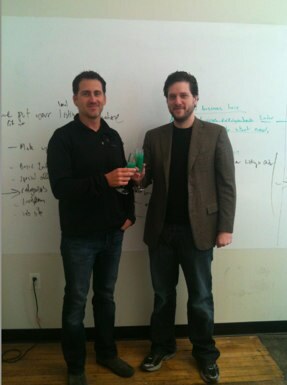 (The two are pictured here enjoying some green St. Patrick’s Day champagne yesterday when they told me the news). Yext started with pay-per-call ads online targeted at local service businesses. That business is its main source of revenues, but more recently Yext launched a local search advertising product called Tags aimed at small businesses who want better visibility on local directory sites other than Google. From one dashboard, small businesses can manage their search ads on partner sites including MapQuest, Citysearch, Yellowbook, Local.com, SuperPages, White Pages, MerchantCircle, and Topix. “We think tags will surpass calls in a matter of 12 to 18 months,” says Lerman. ” We basically started a whole new company within our company.” One of the character traits that convinced Walrath to become more involved is Lerman’s willingness to take big risks in the pursuit of bigger markets. “Howard is only one I know who is dismissive of a mid-8 figure revenue stream as not being the main product,” he says. Maybe Walrath can help Yext add a digit or two to that revenue figure.